On a pretty regular basis, I'm asked for a waterproof eyeliner recommendation. It's never an easy answer because I think people have different definitions for "waterproof". For me, waterproof means it won't break down at all if submerged in water. I can't think of hardly any products that can hold up to that. Don't get me wrong... I think a number of products are "water resistant", meaning they can stand up to watery eyes, or only become partially compromised if submerged in water. Well.... I think I've finally come up with some liners that are actually waterPROOF. Meaning... get them wet, even rub on them- and they won't budge or fade. 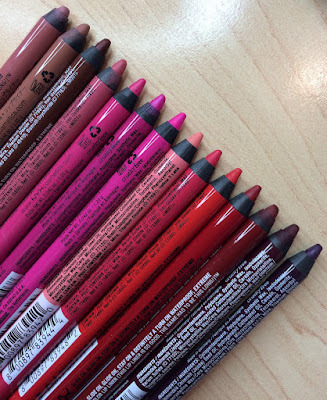 I'm talking about the Milani Infinite Liquid Liners. As you can see, I have these in a range of shades... all of which seem to have equal staying power. There are 8 shades total, and they cost around $7.00 apiece, depending on where you get them. 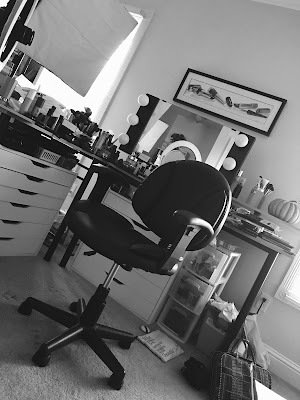 These are the type of makeup products that you might not like when you first use them... but at the end of your day, I think you'll realize you love them. Why? Because they're still there! Let me further explain- when you first apply the liner, you'll notice that the texture isn't a thin ink-type feel like most liquid liners. I'd say this is more like chocolate syrup. It's shiny and kind of thick, and once you put it on, it will take one or two minutes to fully dry. When I first used it, I thought- "well, here's a product that just won't work for me! Too goopy! Won't dry fast enough!" Think it's goopy? Use the opening of the tube to get the brush tip thoroughly cleaned off so you can use it. Think it takes a long time to dry? Just be patient. Put it on and then pluck your eyebrows or something. Why is this a product worth working with? It will last and last. It will actually be quite stubborn when it comes to taking it off. Not only can this liner conquer water (easily), but it also put up a good fight against several makeup removal techniques, including Almay Eye Makeup Remover, Mary Kay Eye Makeup Remover, Olay Daily Facials Face Wash Cloths and Vaseline. For example, my Olay Daily Facials take off pretty much any other kind of eye makeup. With these liners, there are always some remnants. And it doesn't come off in a way that streams black down your face- it moreso comes off in flakes when you start removing it. My Mally Makeup Remover was the only removal product that seemed to take it off with some ease. Remember- with any stubborn eye makeup, hold the cotton pad or cotton ball over your eye to let the remover begin to break down the product before you carefully rub... it's important to be really gentle with the eye area. Cupcake found a lost toy under the bed & she has a totally renewed obsession with it now. We had an especially great newscast today. Everything was fun & loose! Go Team! I am LOVING the pictures that have been coming in to the Beauty Broadcast Facebook page of pets watching Beauty Broadcast! Click here to learn more about the Cupcake Club. I went to CVS for cold medicine... left with face wash cloths, a nail polish, a lipstick...oh yeah, and cold medicine. Tomorrow is Thursday! This week is flying! I may have to hunt these down the next time I'm in the USA :) I enjoy a good waterproof liquid eyeliner so thanks for the tip! Those look like really good products, and inexpensive, too! I hope to try them out soon! Great post Emily! I recommend these when someone wants a truly waterproof liner. Could you do a video on how to use these? I just picked these up and whenever i try to use them, they create such a thick line, which is not what I want. Thanks! and i have this problem because of monolids, and whenever I blink the eyeliner smears because it takes forever to dry. Thanks! Awesome!! Thanks! I recently moved to NC from IL (woohoo, IL!!) And we spend soooo many hours at the pool and beach, so this is perfect! Vitazing Moisturizer, little liner, little mascara some Palladio chapstick and I'm good to go! I wish we had Milani in Canada. I can never find it anywhere. These would be amazing for summer. I so agree with you on the thickness, I thought I would hate it because it took forever to dry. But at the end, it was all worth it because this is the only liquid liner or any liner that will literally stay on my eyes. I agree, it is so difficult to find waterproof liners which really are waterproof. Thank you for this post and I'll definitely be tracking these down when I come to the USA, hopefully sometime soon. Love your blog and videos! Yay, I'm glad these are good. I just ordered the purple one on Cherry Culture last week, so it should be here soon. Have you tried the new NYX slide on glide on eyeliners? I bought a few of those with that order as well, but haven't heard too much about them. Supposedly they are dupes for Urban Decay 24/7 liners. This liner looks a lot like the consistancy of the Gosh Extreme Art Liners. Have you tried them and do you find these better? I've never tried anything by Milani but I only hear good things about it...these might be my first purchase! I have this eyeliner in powerful which is a bronze metallic... I love it. I use boots eye makeup remover pads or Mac cleanse off oil... Both work perfect! Great review! oh I am going to have to try those liquid eyeliners! Thanks for the heads up. I really love liquid eyeliner, but sometimes they make my eyes water which can make the whole thing not even worth messing with! I will try these with much anticipation that I will not end up with black liquid smeared around my eyes looking like a racoon. I always get crazy watery eyes, they are so sensitive! I have to try these out :D I do like the Milani Liqifeye pencil but I never tried anything else by them. Another nice review. I ran out to my local CVS and picked up the metallic green one called "Eternal". It is awesome! It has such a vibrant color perfect for summer. And man do they stay on tight. Even my makeup remover had a tough time removing it. I will definitely be buying more of these! Does anyone know what the applicator is like? I'm really bad with anything but felt tip lol. I use Maybelline Line Stiletto but it only comes in black and brown and I want to try more colors! Love all of your reviews and videos on YouTube. Have you tried Kryolan Cake Eyeliner Sealer? It is great for turning powder eyeliner into water/smudge-proof liner. I have hooded eyelids and haven't been able to wear eyeliner without it transferring to the upper eyelid. I haven't had that problem since using the Kryolan. It makes a fantastic liquid eyeliner and it's very inexpensive, and a little goes a LONG way. Thanks for the recommendation! I recently purchased this and you were absolutely right - it is truly waterproof. It does take some time to remove it but I'll take that over smudged eyeliner any day. Rose - the applicator is similar to a liquid paper white-out brush. I also use the Maybelline stiletto and it took some practice for me to get a thin line with the Milani eyeliner. oh wow! these sound like awesome liners! I really liked reading this review. I also think the Wet n' Wild H2O proof liners are REALLY great. Especially as far as waterproof goes. I hope that This beauty product may be good.I will try.For more information about beauty Product visit sleekhair wesbite. Can you please try these on your eyes . I would like to see how light the timeless one is , if you dont mind. يبحث الجميع وراء أعمال التنظيف الجيد ولكن البعض لا يعلم إلى أين يذهب حتى يحصل على أفضل خدمات وأعمال التنظيف، فكل هذا لا يتواجد سوى لدى شركة تيجان التي تتميز بالخبرة وأعمال التنظيف الذي لا يوجد لهل مثيل بأي مكان بجدة، فالشركة لها الكثير من الفروع الموجودة بجميع أرجاء المملكة. تعد شركة تنظيف بجدة واحدة من أكبر وأهم شركات التنظيف بجدة، كما أن الشركة تحرص على أن تقدم إلى عملاء الشركة الكثير من الخدمات والعروض التي تحصل على إعجاب معظم سكان جدة وعملائها. الشقق من أكثر الأماكن التي تحتاج إلى عمليات تنظيف متميزة، ولهذا يكون من الأفضل اللجوء إلى شركتنا شركة تنظيف شقق بجدة، لأنها الشركة الوحيدة القادرة على تقديم افضل أعمال تنظيف شقق بجدة، كما أنها تقوم باستخدام أجود مواد التنظيف وأحدث الأجهزة. تعتبر المنازل من الأماكن السكنية الأكثر استخداماً في جدة، وتحتاج إلى التنظيف المستمر نظراً لتراكم الأتربة والأوساخ بالمفروشات والعفش والأثاث، ولهذا تستعين معظم نساء جدة بشركة تنظيف منازل بجدة لأنها من الشركات التي تعمل بجد واجتهاد عن طريق استخدامها لأحدث المعدات والأجهزة. تتميز شركتنا بأنها توفر خدمة تنظيف الفلل بجدة وتلك الخدمة يحتاج إلى معظم قانطين الفلل والقصور، وهي من أكثر الأماكن التي تحتاج لفريق عمل كبير ومتميز لديها الخبرة فهذا النوع من أعمال التنظيف، فلدينا عمال متخصصين في تنظيف الحدائق والمسابح، كما نعمل على تخصيص فريق العمل كلاً منهم له العمل المخصص له والذي يلتزم بالقيام به على أحسن ما يكون. تتميز معظم شركات التنظيف بجدة بعملها الجيد والممتاز وأجهزها ومعداتها المتطورة، كما أن تلك الشركات تعمل على تطوير ذاتها باستمرار لذا تقوم باستخدام أحدث المعدات والأجهزة التي تجعلهم يحصلون على أفضل أعمال التنظيف. تهتم الشركة بأن تقوم باستخدام مواد التنظيف العالمية لجودتها العالية، كما أنها تقوم باستخدام التنظيف بالبخار الذي يعتبر الأفضل والآمن على الأغراض والمفروشات. التنظيف بالبخار بجدة هو من أفضل الاختيارات الذي يهتم العميل بأن يحصل عليها من قبل شركة تنظيف بجدة، فهو من أحدث الوسائل التي تستخدم في تنظيف السجاد والكنب والستائر والمفروشات بأكملها. تنظيف السجاد من الأعمال الصعبة جداً على سيدة المنزل فيتراكم به الأتربة والأوساخ والبقع الصعبة التي تحتاج لكثير من المواد للعمل على إزالتها والتخلص منها، ولذا يستعين أغلب السيدات لأفضل شركات تنظيف سجاد جدة نظراً لقيامها بأعمال تنظيف السجاد بجدة على أفضل ما يممكن، فلدينا فريق عمل متخصص في أعمال تنظيف السجاد بجدة، كما تحرص الشركة على القيام بتنظيف السجاد بالبخار فهو الحل الأفضل الذي لا يترك أي أثر سلبي على السجاد والمفروشات. للكنب أهمية كبيرة في حياة كل شخص فيستخدم الكنب في المنازل والفلل والقصور والشركات وخلافه، كما أن الكنب من الأغراض التي تتعرض لكثير من الأوساخ والأتربة والبقع الذي يكون من الصعب إزالتها باستخدام المساحيق العادية، فدائماً أنت بحاجة إلى شركة تنظيف كنب بجدة للحصول على أفضل أعمال للتنظيف فأنت دائماً تكون بحاجة إلى واحدة مثل شركتنا لقدرتها الفعالة في أعمال تنظيف الكنب والمفروشات. يعد التنظيف بالبخار من أحدث الوسائل التي تستخدمها شركات تنظيف بجدة، كما أنها آمنة للغاية ولا تترك أي أثر سلبي على المفروشات فالتنظيف بالبخار لا يقتصر استخدامه على الكنب والسجاد فقط فهو أيضاً يستخدم في تنظيف الأسطح والأرضيات الخاصة بالمطبخ والحمام، كما أنه يساهم في التخلص من الروائح الكريهة الموجودة بالمنازل، ويعمل على التطهير والتعقيم وإبادة الحشرات بجدة. Makeup Dupes on Great Day St. Louis! Alert! There's Been Another Color Explosion! My Favorite Summer Lip Glosses!